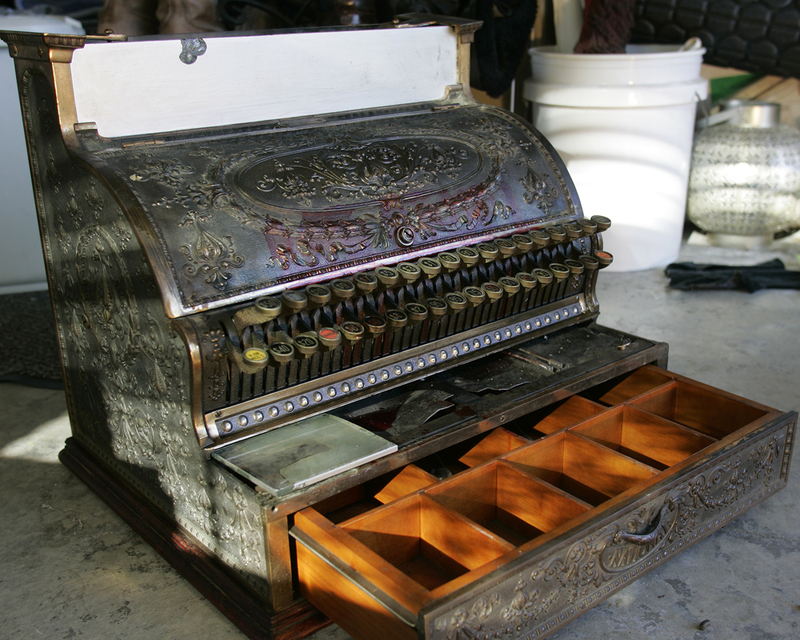 In February of this year, the first thing we purchased for Oddyssea was a 1909 National Cash register model #367. It’s a monster. You can see what it looked like when we acquired it in this post. Aside from really liking the look & feel of these pieces of technology history, the register originated in the Silicon Valley of the time, the Miami River Valley in Southern Ohio – a hot bed of innovation from the 1880’s to the mid-1950’s. The areas of innovation were broad: flight (Wright Brothers,) automotive (Charles Kettering et al,) and mechanical computers (NCR aka National Cash Register.) And, it’s our ancestral home, so to speak, since Ellen and I both hail from that part of the world. Initially, I’d intended to restore the register myself. But once I opened it up and started the process it became clear I could a) restore the register or b) build the store. There was no way to do both concurrently. That’s where the good folks at HBAC Group came in – they were able to receive, restore, and ship the register back to us in California. It arrived on a pallet yesterday outside the store. FedEx was a royal pain in the hind end during this entire process. If not for the creativity of Carlos over at the UPS Store in Half Moon Bay and Barb at HBAC Group, we might not have been able to get the thing shipped there and back safely. The crown jewel was FedEx refusing to bring the register into the store because we have 6 steps in the front. Fortunately, I was headed back to the store in any case and happened to have a friendly gentleman, Marquis, out in front who offered to help me move it into place sans pallet. We did so and you can now see the register in its natural habitat. You are currently reading Return of the Register at Oddyssea.